London has always been a cosmopolitan City. Many settled here from within the Roman Empire. Later the Angles and Saxons, Jutes and Friesians, Danes and Norse came. In 1066 we were conquered by William, the Duke of Normandy, and many from that part of the world came to live here. The Jews, Flemish, Lombardians came. Then the Huguenots, Irish, Italians, Sephardic and Ashkenazi Jews, Indians, Chinese, Bangladeshi and Somalians to name but some! Many later immigrants escaping persecution settled outside the City walls on the East side where land and housing was cheap. Each group left its mark as it moved on. Our walk will take us through the districts or Spitalfields and Whitechapel as I tell the story of some of these settlers, how and where they lived, and worshipped. How they survived, how they contributed both then and now. 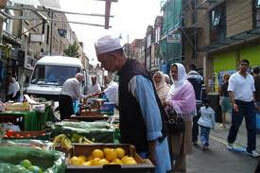 Many a well-known person started life in the East End – Lord Sugar had a stall in Petticoat Lane market; Mr Cohen’s descendants went on to found Tesco’s; the Moses Brothers set up shop as Moss Bros. Not surprisingly, the area is immensely rich in culture, architecture and history, full of hidden gems. We end near Aldgate tube station. I shall be leading this walk on Saturday February 4th, 2017. Meet Liverpool Street station (Central, Hammersmith & City, Metropolitan & Circle lines) Bishopsgate exit, 10.45am.